Pressure cook the potato upto 1-2 whistle. Allow to cool & deskin. Add oil in a pan, add cumin seed,mustard seed, grated ginger, chopped tomato & saute few mins. Add red chilli powder, boiled potato & mix well. Check the seasoning & Serve hot with rice or roti. Delicious curry, very simple n easy! That title is enough to make my mouth water. That looks totally delicious! Wow simple and easy curry.very nice.Looks very colour ful. Simple and delicious curry.. looks perfect..
Just love anything with potato and this curry looks fantastic..
All time favourite.... looks absolutely yummy! Simply love the way it has been roasted just enough. The picture by itself is very inviting. Baby potato curry looks yum!!! 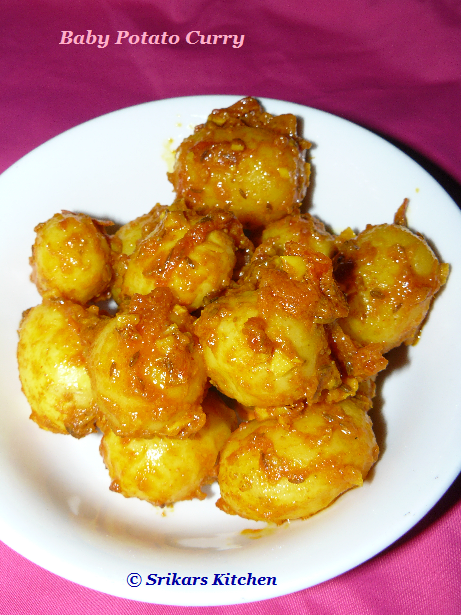 A simple and delicious curry..
Yum, potatoes look so flavorful and spicy!